When it comes to rifles, there’s quite a serious dearth of them here in Pakistan. I am talking about quality weapons, meant for hunting, or for competition shooting. If you are able to find a fine rifle you will run in to difficulties finding its ammo. The one time popular 7 mm (7 x 57) ammo isn’t available and even if you find some it will be exorbitantly priced, so finding an (inexpensive) rifle in that caliber is easy. But then there’s ample ammo available in 308 Winchester but buying a rifle is not easy. Firstly no one wants to let go of it, and even if you are able to find one, it will be very expensive. So to solve this problem the local gunsmiths have come up with good solutions for the local market. In that 308 Winchester and 7.62x54R (called as “Dungar”, because of Dragunov) have been favorite choices all along. The rifle being reviewed is a local rifle using a Russian Goryunov MG barrel and a P14 or P17 Enfield action with a local stock. Its a well made rifle, as you shall see. The P17/17 action with safety is strong to sustain the pressure created by a 7.62 x 54R round. Observe the checkering and Picatinny Rails. The finest wood is used in making these stocks. See the checkering on the grip and the cheek rest. Top view showing Bolt, safety, Picatinny rails. That is one fine rifle. 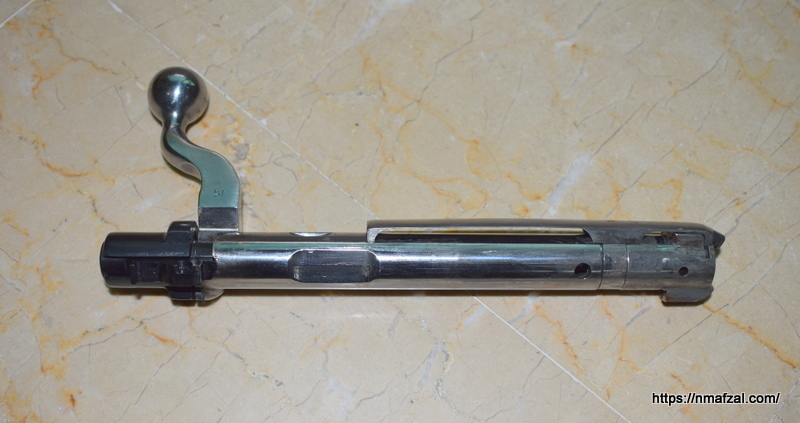 See the markings on the barrel. The front sight off a PK was removed from this place. Also since the original barrel is finned and comes with a flash hider, both are cut and removed. You have a Bull barrel, chrome lined off course! These local Dungar rifles are being made in Pakistan since early 80’s during the Afghan War. The ample availability of inexpensive Russian MG barrels (7.62 x 54R, chrome lined) and P14/17 Enfield rifles resulted in these weapons. Local gunsmiths did a fine job of fitting these beautiful wooden stocks. Now Picatinny rails are machined in them to mount a scope. The rifles can shoot pretty accurately till 200 ~ 300 M. As the 7.62 x 54R is a very potent round and bullets are steel so not really preferred choice for a hunting caliber as the bullets ricochet easily. But if it comes to price and availability of cheap ammo, nothing can beat this caliber, not even the infamous 308 Winchester. As of now you can get them made in around Rs 100k, add another Rs 50k or more for a decent scope. The ammo is still dirt cheap by Pakistani standards. 🙂 In short to say this is the poor man’s rifle, good quality stuff.